A couple years ago, there were a lot of "what people think" memes placed on social networking sites. These usually involved a series of pictures subtitled with lines like, "what my mom thinks I do" or "what society thinks I do." Usually at the very end there is a final photographic punchline. --Wolf Bauer, a staple of the 20th century climbing and rescue scene in the Pacific Northwest, died this week at the age of 104. Wolf was a leader in the creation of the Mountain Rescue Council. To read more, click here. --A Bellingham skier’s body was recovered Monday afternoon, Jan. 25, a day after he died in an avalanche on Mount Herman, near the Mt. Baker Ski Area. On Sunday afternoon the man, identified as Mark Panthen, 36, and a friend had been skiing at the 4,200-foot level on the north slope of Herman, a popular backcountry destination just north of Mount Baker when the slide hit. To read more, click here. Mark leaves behind a wife and two children. A memorial fund has been set up to help them out, here. --Not much info, but a BASE jumper apparently got stuck in the trees in Index. To read more, click here. 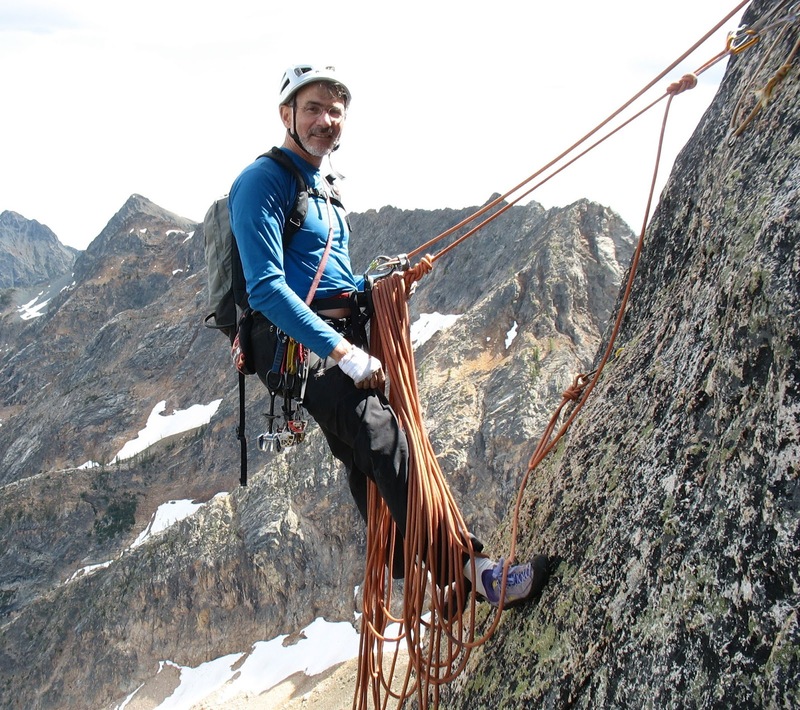 --American Alpine Institute Guide Like Liz Scholarship applications are due on January, 31, 2016. --AAI Guide and Director of IT and Marketing, Tom Kirby, recently talked to Backcountry Magazine about the Guide Like Liz scholarship. To read the article, click here. Here is the link to the public announcement. The form to submit comments is here. For a public comment to be valuable, the comments must be individualized and personalized. That means that copying and pasting is not going to work well. Below are some general talking points that can help you craft a letter. If you would like further information on any of these ideas, Wilderness.net is a good resource. 1. The current system does not provide sufficiently diverse opportunities for visitors who would choose to access Yosemite wilderness with a guide. 2. 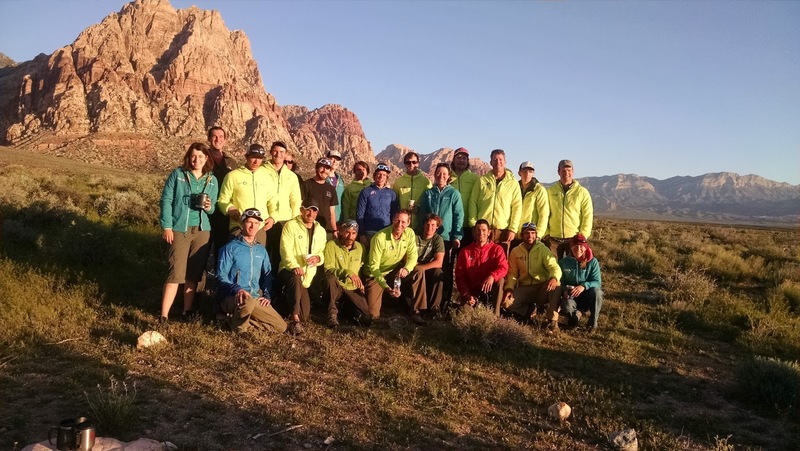 Modern professional mountain guiding helps realize the formal educational public purpose of wilderness-from the skills training we all provide to guide education programs such as the AMGA. 3. As rock climbing and mountaineering are not at capacity in Yosemite wilderness, the plan's analysis of commercial services should reflect that, and should provide for additional diverse opportunities for the guided public. 4. Modern, trained guides are invested, professional stewards of the land and the wilderness resource. 5. 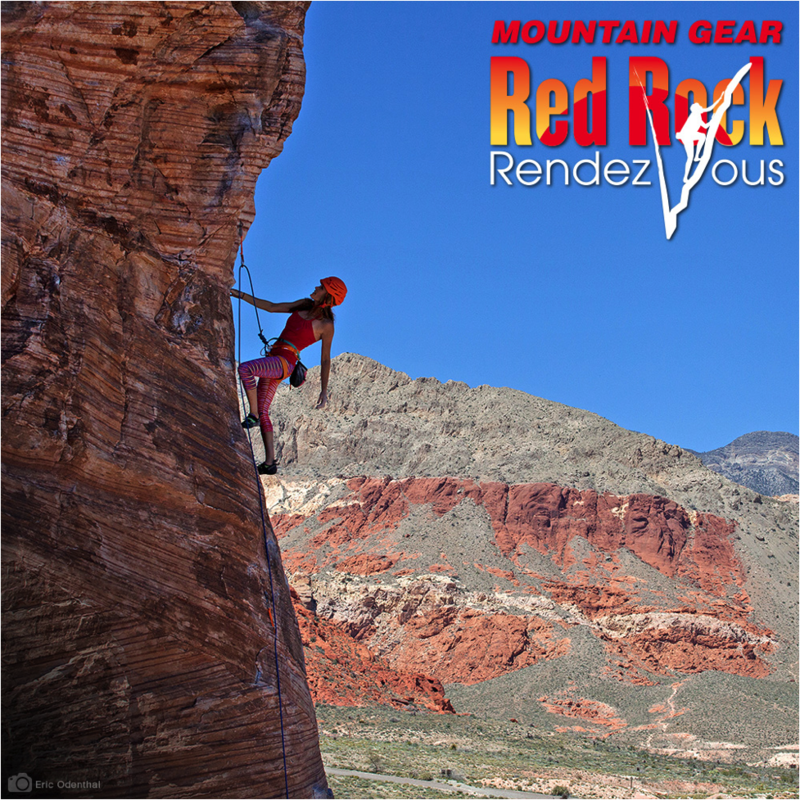 Additional rock climbing and mountaineering guiding opportunities should be made available in the form of limited, low-ratio Commercial Use Authorizations (CUAs) that are reasonable for sole proprietors and small businesses to obtain. 6. The highest professional terrain-specific credentials should be considered as selection criteria for obtaining a CUA. These provide the highest quantifiable assessment of guide quality and skill, and serve to enhance visitor safety, resource stewardship, and reduction of social impacts. Those credentials are the AMGA Rock Guide, the AMGA Alpine Guide, and the IFMGA Mountain Guide (certified in rock, alpine, and ski mountaineering). --Brady Robinson, the executive director of the Access Fund, wrote an excellent opinion letter to the New York Times about the Delaware North Company and it's immoral theft of Yosemite National Park's place names. To read the letter, click here. 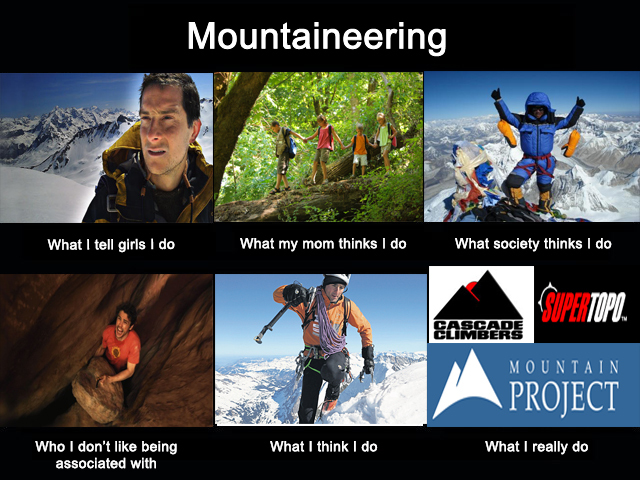 --The independently-owned Mt. Rose Ski Tahoe is officially up for sale. Fritz Buser, majority owner of the Reno-area winter resort since 1971, “is looking to sell the resort,” according to a statement issued late Saturday afternoon. To read more, click here. --Las Vegas rock climber David Allfrey got a big nod from the American Alpine Club last week, winning the prestigious Robert Hicks Bates Award. The annual award recognizes a young climber who has exhibited exceptional skill and character in the climbing or mountaineering arts, and who has outstanding promise for future accomplishment. To read more, click here. --A small earthquake hit Joshua Tree National Park on January 24th. There were no reports of damage. To read more, click here. --After making it through mid-January without an avalanche death, Colorado, the country's notorious leader in such deaths, has recorded its first two deaths just two days apart last week. To read more, click here. --A skier suspected of throwing a snowboarder off a chairlift Sunday at Aspen Highlands will be charged with a crime “in the near future,” a law enforcement official said Thursday. To read more, click here. --It shouldn't be that surprising that ski area employees are having a hard time with housing in posh exclusive ski towns. --The Environment Foundation, an Aspen Skiing Company employee-funded, founded and directed foundation has awarded more than $2.8 million to 469 diverse local environmental projects since its inception in December 1997. Almost 1,800 employees per year contribute to the foundation directly from their paychecks. During the fall 2015 funding cycle, the Environment Foundation Board’s largest grants focused on renewable energy and planning efforts to preserve the heavily impacted Maroon Bells-Snowmass Wilderness areas. Grants to improve the health of the Roaring Fork River, support communities opposed to inappropriate oil and gas development, cultivate future environmental stewards, and ensure popular hiking and biking trails remain in sound condition were also funded. To read more, click here. --British explorer Henry Worsley set out in November to become the first person to traverse Antarctica solo. After 913 miles and suffering from a stomach infection, he was airlifted to a hospital in Chile on Friday, where he died over the weekend. To read more, click here. --An avalanche near Big Sky that resulted in a ski patrol member's death was triggered by humans, an investigation shows. On Jan. 19, Darren Johnson, 34, died while assisting the Montana State University Avalanche Research Team in the Cedar Basin area, according to a release from the Yellowstone Club. To read more, click here. --A 22-year-old skier was caught, partially buried and injured in a large avalanche at Holy Toledo Tuesday afternoon. Officials said the avalanche was on a steep northwest slope about 10,200 ft. in Cardiff in Big Cottonwood Canyon. To read more, click here. --The editor-and-chief of Alpinist magazine is being recognized at the American Alpine Club dinner for excellence in climbing literature next month. This is a well-deserved award. To read more, click here. --Professional freeskier Angel Collinson recently took a major fall on an Alaskan peak. In a gut-wrenching video she can be seen tumbling down a guy over a thousand feet. Luckily, she only injured two fingers in the incredible fall. To see a video of the fall, click below. To read more, click here. --Alpinist, Colin Haley recently completed the the first solo ascent of Torre Egger, a peak considered the most difficult summit of the Torre Group in Patagonia. To read more, click here. --Motorists in Northern California have been dealing with a new kind of road hazard: Overly aggressive coyotes who may have consumed hallucinogenic mushrooms. Pacific Sun reports that at least two coyotes have been staring down motorists on Highway 1 in Bolinas, a community in Marin County, and striding onto the road. When a driver stops to avoid hitting them, the coyotes usually sniff around the car before running off. To read more, click here. 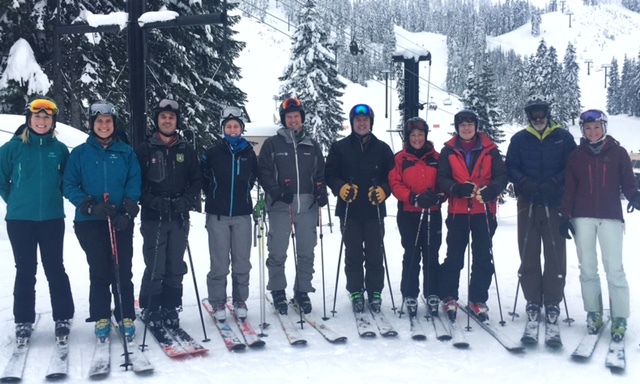 --AAI Director of Operations, Jason Martin, participated in a roundtable discussion on climate change and its effect on the outdoor industry with Congresswoman Suzan DelBene at Stevens Pass Ski Resort this week. Jason was part of a select group of industry leaders from the Pacific Northwest. The team discussed issues revolving around increased wildfires, floods, and uneven snow years. After the productive conversation, the group all went skiing together. And Congresswoman DelBene can rip. She grew up in Colorado and was on a ski team...! To read more, click here. --Oregon ski area operators and the state’s trial lawyers association are trying to craft a compromise on an update to the state’s ski statute within the next two weeks. On Friday, the House Interim Committee On Consumer Protection and Government Effectiveness held an informational hearing in Salem on the case for an update to the 1979 statute. A state Supreme Court ruling in 2014 on a personal injury lawsuit brought by a skier who was injured at Mt. Bachelor has brought the issue of ski area liability to the attention of the Legislature. To read more, click here. --The search for missing California ski instructor Carson May, who disappeared in an avalanche-prone area north of Lake Tahoe, was suspended Tuesday night. To read more, click here. --Pro skier JT Holmes says he’s still shaken five days after being buried and going unconscious in an avalanche northwest of Lake Tahoe. Holmes, who is known for pushing the boundaries of big mountain skiing and speed riding, said he was skiing with friends on Thursday near Truckee, Calif., when the slide occurred during the group’s fourth run of the day. To read more, click here. --The names of iconic hotels and other landmarks in Yosemite National Park will soon change in an ongoing battle over who owns the intellectual property, park officials said Thursday. The luxurious Ahwahnee Hotel will become the Majestic Yosemite Hotel, and Curry Village will become Half Dome Village, said park spokesman Scott Gediman. The move comes in an ongoing dispute with Delaware North, the company that recently lost a $2 billion bid — the National Park Service’s largest single contract — to run Yosemite’s hotels, restaurants and outdoor activities. To read more, click here. --An avalanche triggered by a snowboarder in a closed area of Sugar Bowl Resort on Friday, Jan. 15 has been fully investigated by resort officials, and the snowboarder now faces prosecution. Christian Michael Mares triggered an avalanche at approximately 12:45 p.m. on Friday Jan. 15 after knowingly traversing into an area of the East Palisades called “Perco’s,” which has not been open to the public since the 2010/11 ski season. The area is clearly marked as closed from both the Mt. Disney and Mt. Lincoln directions, and it is a very active avalanche area. As such, Mares put himself, his friends, ski patrol and the skiing public at risk. To read more and to see the video that lead to the resort's decision to prosecute this snowboarder, click here. --The 12-pitch WI 5 Widow's Tears in Yosemite Valley has seen several ascents over the last couple of weeks. This obscure ice route is seldom climbed. To read more, click here. --Despite a fourth consecutive year of drought, rockfall activity in Yosemite National Park in 2015 was about average, with 66 documented events (rockfalls, rockslides, and debris flows). The cumulative volume of all events was about 8,700 cubic meters (roughly 25,000 tons). To read more, click here. --Rescue team volunteer Scott Hicks was responding to a call about a woman who died while rock climbing when he received a shock: The body belonged to his ex-wife. Hicks, 58, and other members of the Santa Fe County Fire Department technical rescue team were sent to Diablo Canyon to recover a body Monday afternoon, the Santa Fe New Mexican reported. They were told a 59-year-old woman fell 175 feet to her death. To read more, click here. 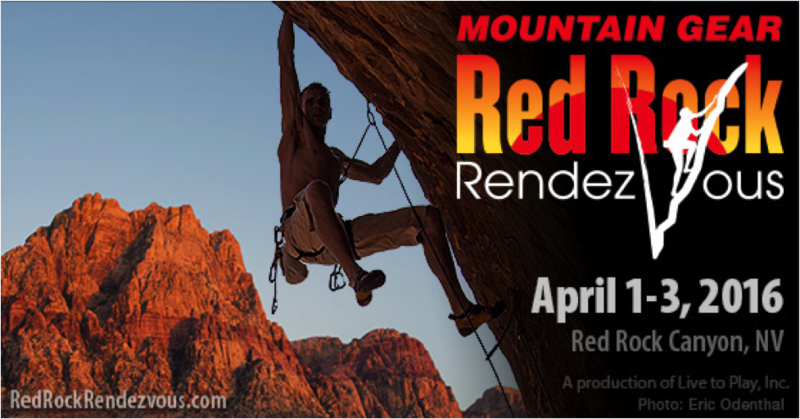 --Climbers have been exploring Grand Canyon National Park for decades. 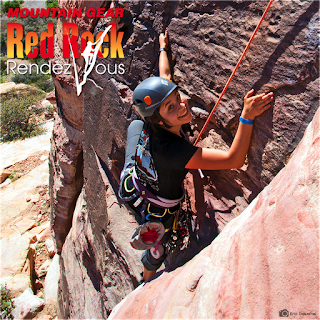 The desert alpine climbing area provides many classic summits such as Zoroaster Temple and Mount Hayden. Much of Grand Canyon National Park is classified as “proposed Wilderness,” and as such it is managed under the same set of guidelines as a designated Wilderness area. The Park recently issued a DRAFT Backcountry Management Plan / Environmental Impact Statement, which proposes fixed anchor regulations, day-use and overnight permits, climber use monitoring, climbing impact assessment, climber education, and the development of a standalone climbing management plan. To read more, click here. 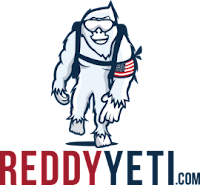 --For a round-up of the Ouray Ice Festival mixed competition results, click here. --Skiers and snowboarders often don't see eye to eye, but one skier who shared a chairlift with a snowboarder took things to a new level Sunday at Aspen Highlands. The skier, a white man in his late 20s or early 30s, took offense to a seemingly innocuous comment by the snowboarder sitting next to him and threw the man off the Loge Peak chairlift, said Seth Beckton of Aspen, the snowboarder who was pushed. To read more, click here. --Earlier this month, Jefferson County Open Space (JeffCo) in Colorado released its Final Climbing Management Guideline (CMG) that will govern climbing in Clear Creek Canyon, Mt. 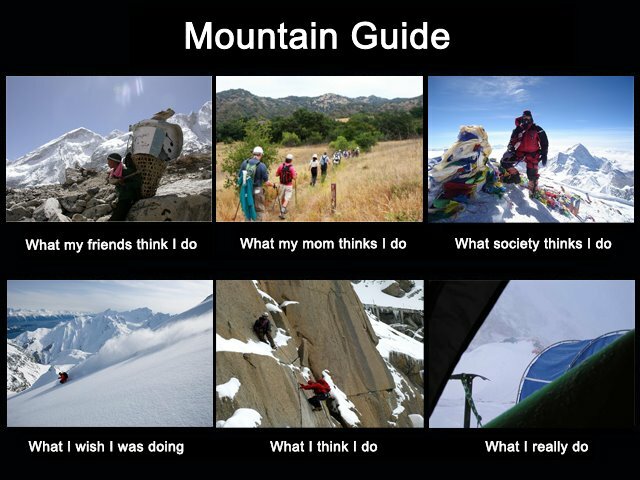 Lindo, North Table Mountain and other JeffCo-managed climbing areas. The county released a draft of its CMG in November with little public input, alarming many local climbers with proposed regulations that would unnecessarily encumber climbing access and route development. In response, JeffCo officials initiated an abbreviated public process and solicited input from the Access Fund and local climbers. To read more, click here. --A skier died in an avalanche in the northern Madison Range near Big Sky on Tuesday afternoon and officials warn of dangerous conditions throughout the mountains of Southwest Montana. A release from Doug Chabot, director of the Gallatin National Forest Avalanche Advisory, said the man died after the avalanche swept him into some trees near Cedar Basin. Three of his skiing partners rescued him quickly but he died as a result of trauma. To read more, click here. --The man who died in an avalanche near Hatcher Pass Saturday was identified as 25-year-old Warren Carlyle, Alaska State Troopers wrote in a dispatch. Troopers were notified of that an avalanche took place Saturday afternoon just east of Summit Lake on Hatcher Pass Road in Palmer. To read more, click here. --A ski patroller in Utah was buried in an avalanche Tuesday and remained under the snow for as long as 10 minutes before being rescued, police said. The 31-year-old man was performing avalanche reduction just northeast of Powder Mountain's James Peak around 9:15 a.m. when a loose slab of snow triggered an avalanche that dragged him about 1,800 feet down the mountainside, said Weber County Sheriff's Lt. Brandon Toll, who oversees the agency's search and rescue team. To read more, click here. --Despite a low snowpack and seemingly early-season conditions on Mount Washington, an avalanche on Sunday triggered by two climbers swept a Tuckerman Ravine gully, catching four and leaving two injured. The slide occurred just before1 p.m., according to the U.S. Forest Service Mount Washington Avalanche Center, in The Chute, a narrow gully just left of the Tuckerman Headwall. To read more, click here. --A skier was caught in a two-foot deep avalanche and carried along the Park City ridgeline Tuesday afternoon. The skier was not seriously injured. To read more, click here. As first degree frostbite is common on expeditions or ice climbing trips, it is also common that it needs to be treated in the field. The most important thing with this mild frostbite is to rewarm the area. Rewarm the injured areas slowly and start working from the outside in. In other words, go toes to feet and fingers to hands. Extremities may be warmed under inside clothing or sleeping bags, arm pits or in the groin. Never rub or massage a frozen area. This merely rubs the ice crystals around on the delicate cell walls which causes additional injury and pain. Once it is rewarmed and thawed, it is very important that the area is not re-frozen. If the injury is re-frozen theseverity of the injury will increase. --A small group of skiers skied off the top of Mt. Si recently. This may not seem that astonishing, but the mountain is capped by a tower of rock...which they skied. To read more, click here. --A rockfall occurred above the El Portal Road (Highway 140) at approximately 5:45 tin the morning on Thursday, January 7, 2016. 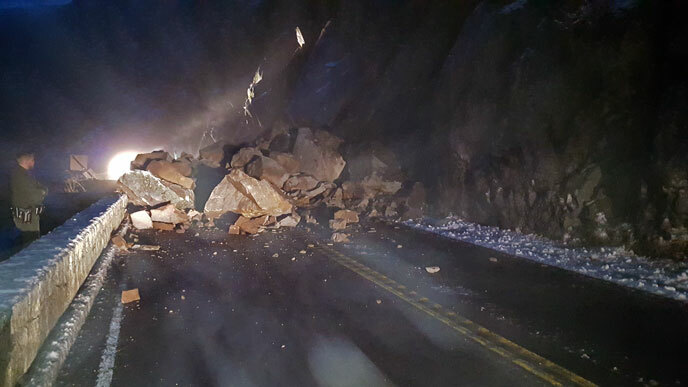 Due to the rockfall, the El Portal Road (Highway 140) is closed from the park boundary in El Portal to the junction of El Portal Road/Big Oak Flat Road (Highways 140/120). The road will remain closed as park crews assess the situation. There is no estimated time for reopening. To read more, click here. --The remains of a man police believe shot and wounded a state park ranger in 2010 and eluded more than 100 officers in a desert manhunt have been found, authorities said. Skeletal remains believed to be those of Lance Leeroy Arellano were discovered Thursday in a narrow cave near Moab, the Grand County Sheriff's Office said in a press release. Arellano was 40 when he disappeared. To read more, click here. --A spike in radiation levels in soil around an active uranium mine just a few miles north of Grand Canyon National Park has led the Arizona Department of Environmental Quality (ADEQ) to suspend air pollution permit renewal applications for three uranium mines. All three mines are located on public lands near the park popular with campers and hunters. To read more, click here. --A report released this week by the Interior Department’s inspector general revealed a years-long pattern of sexual misconduct on Grand Canyon river trips conducted by National Park Service boatmen, contractors, and other federal employees. The report, spurred by a letter sent by 13 alleged victims to Interior Secretary Sally Jewell, cited some 35 incidents spanning 15 years. And though it doesn’t name the subjects of its investigation, the report focused on three former and one current Park Service employees, identifying them only as Boatman 1, Boatman 2, Boatman 3, and Supervisor 1. To read more, click here. --Looking for a summer internship in Zion National Park...? Click here. --Richard Wright, a prolific Colorado new-route and crag developer, passed away January 4 after three years of fighting mantle cell lymphoma. Wright developed countless new routes along the Front Range of Colorado, and was a pioneer in the Rifle area. To read more, click here. --A backcountry skier was rescued in the Sugar Bowls area Monday evening, according to the Pitkin County Sheriff's Office. Around 5 p.m., a skier called the Pitkin County Regional Emergency Dispatch Center because she was stuck in the Sugar Bowls area after experiencing an equipment problem. The skier left the Buttermilk Ski Area after hours to ski alone in the Sugar Bowls and reported that she was cold, weak, tired and unable to move. To read more, click here. --People skinning up inside Aspen Mountain Ski Resort are making it difficult for snow cat drivers. To read more, click here. --Skier visits at 21 Colorado mountain resorts were up 10 percent during the first two months of the ski season compared to a year earlier, Colorado Ski Country USA reported Tuesday, with its CEO citing "some well-timed storms" early in the season. To read more, click here. --Climbing magazine is looking for a digital intern. --Despite the armed takeover of a federal wildlife refuge in Oregon, voters in the Rocky Mountain West still strongly support keeping their public lands in federal hands, according to the latest version of a bipartisan conservation poll. “These findings show us the Bundy family and the politicians who sympathize with them are far out of touch with most people in the West,” said former U.S. Interior Secretary Ken Salazar, who participated in Monday’s Colorado College conference call on the annual Conservation in the West poll. “What Westerners are actually concerned about is drought, water scarcity and climate change.” To read more, click here. --A 30-year-old Calgary man limped away with a knee injury this week after an avalanche swept him and his friend down a steep gully in Canada's Banff National Park. To read more, click here. --The following video is bound to give you nightmares for weeks, or maybe longer. A massive western rat snake slithered down the wall, down the anchor and down a climber's leg in West Virginia's Seneca Rocks recently. To read more, click here. To see a video that will give you the heebee jebies, click below. --Snowbird Ski and Summer Resort wants two chairlifts and a zip line on property it owns in American Fork Canyon. Located north of Tibble Fork Reservoir in the canyon, some of the area is owned by the resort company. Based in Little Cottonwood Canyon in Salt Lake County, Snowbird shares a common ridgeline in the Wasatch mountain range with its American Fork property in Utah County. To read more, click here. --Here's a cool concept. A new website is promoting outdoor company start-ups with GIVE-AWAYS. They are primarily promoting mom-and-pop style companies that build and market their own gear. To learn more about the website (reddyyetti.com), click here. --Colin Haley and Andy Wyatt, both from the United States, have completed the first known one-day “car to car” ascent of Cerro Fitz Roy in Patagonia. To read more, click here. 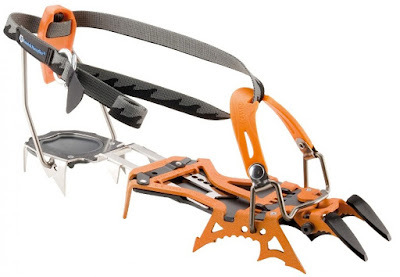 The Camp Cassin Blade Runner crampons are a new super modular addition to the world of crampons. They are designed with several elements that can easily be changed. First, they can be configured with a mono-frontpoint or a dual-frontpoint. This isn't really new, the Petzl Lynx does essentially the same thing. The big difference here is that there are two options for the frontpoints. The Blade Runners come with both vertical and horizontal options. Second, there are multiple options for the toe bail allowing the crampon compatibility with highly technical boots as well as with less technical options. As there is a clip on the back of the crampon, a heel welt is required for the boot to work. These are super aggressive crampons. I don't think I've ever encountered a pair that sports fourteen points. Indeed, there are even points on the extender bar. After using these crampons on technical ice for several months, it didn't seem like the points on the bar did anything extra, but provide additional weight to the body of the crampon. I like the aggressive nature of the crampon, but wasn't psyched on the the aspects that added weight. On the subject of weight, at first glance, these guys seem heavy. They clock in at approximately 36 ounces (2.25 lbs), which is certainly more than I was used to. 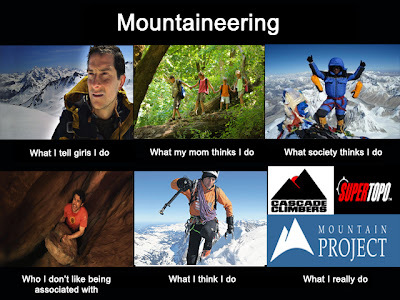 I had been using mountaineering crampons for ice climbing for the last couple seasons, which isn't a fair comparison. Other similar technical crampons are actually a hair heavier: Lynx, 38 oz, 2.3 lbs; Rambo 4, 41 oz, 2.5 lbs. So the Blade Runners are a better option than many of its technical competitors. The problem with comparing the weight comes in when you consider that these crampons are meant to do it all. 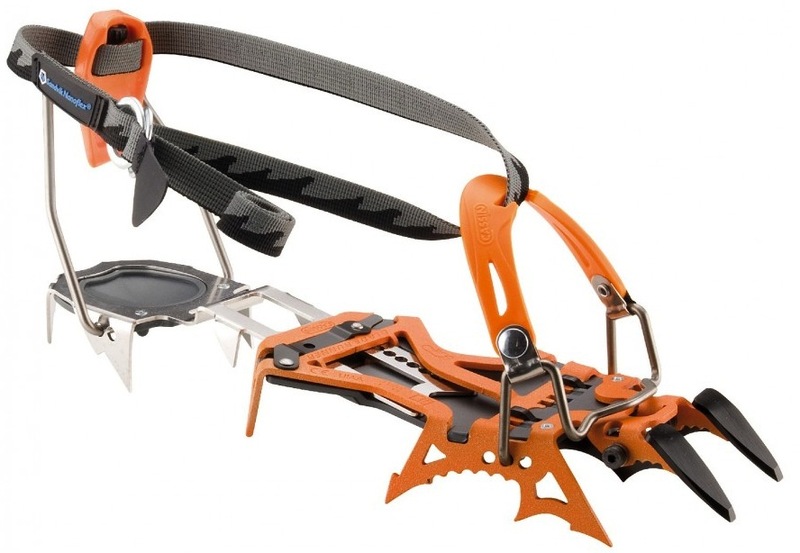 The horizontal frontpoints exist for mountaineering routes, and as soon as you compare the Blade Runners to common mountaineering crampons, they are bit heavier. Consider the Petzl Vasak, which clocks in at 33 ounces (2 lbs), or the Girvel G12 which clocks in at 31.7 oz (1.98 lbs). For some this difference doesn't matter. And if you're not one of those that counts every ounce, then maybe this doesn't matter. The crampon can do it all and as such maybe the $350 price tag is worth it, so that you don't have to buy one pair of mountaineering crampons for $200 and one pair of tech crampons for $250. There were two things about these crampons that irked me a little bit. First, I didn't like the immediate options presented for the mono-vertical frontpoint. There are several options available immediately for frontpoint configuration, but for some reason, three of those options requires one to actually cut a in the antibot plate on the bottom of the crampon. Note in the picture above where the crampon point is placed. This particular crampon was for the right foot and the point was set to be close to the right big toe. And this worked fine. However, if you wanted the frontpoint to be centered in the middle of the crampon, then you would have cut a hole in the notch directly left of the current frontpoint's placement. You'll also note that there are other notches that have to be cut out in order for all the options to be easily accessible. 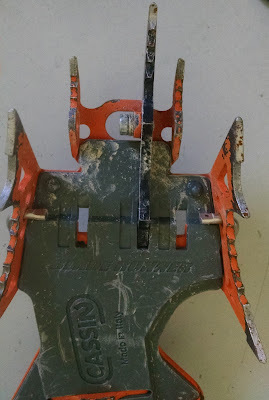 I suspect that the lack of holes for the crampon frontpoint attachments in the base of the crampon has something to do with its design. The engineers didn't want a bunch of extra holes that might not be used. And though I like the frontpoint closer to my big toe than in the middle, it does seem odd that a common configuration requires one to alter the crampons the day that one buys them. Second, the crampon bag is a bit too small. This may seem like a small thing, but in order to fit the crampons into the bag, one has to unclasp the extender bar. Most other crampons collapse without this step. It isn't awesome when it's cold out and to have to reset the extender bar every time you put the crampons on. If your feet are even mildly big, the best thing to do is to use an alternative for a crampon bag. A lot of guides use a heavy-duty USPS envelope. But there are plenty of crampon specific bags on the market that will fit the crampons. The preceding items made me concerned that I really wouldn't like these crampons. At the start, it felt like these things were just way over-engineered. I have not done any mountaineering in the Blade Runners, but I have done a great deal of steep ice and drytooling with them, and they work exceedingly well for that. The vertical frontpoints look just like the blade of an ice tool and indeed, they slice into the ice just as effectively. They are perfectly oriented at the front of the crampon to attain the best bite. And the secondary points are perfectly positioned to bite when climbing with appropriately dropped heels. The mono-vertical frontpont worked well for drytooling as well. The steep angle of the frontpont and it's thin profile allowed for perfect hooks. On several drytool ascents, I did a direct comparison between these and other crampons (the non-technical G12s and the Lynx), and found that these almost universally provided a better experience due to the angle of the frontpoint. Finally, it should be noted that there was a recall on these. However, CAMP has been very proactive in fixing the problem. None of the new models have the problem that the crampon was recalled for. --Doug Walker, a Seattle-based philanthropist and conservationist, was killed in an avalanche on New Year's Eve on Washington's Granite Mountain. Doug was one of those individuals that was at every important event that dealt with outdoor recreation advocacy. He was president of the American Alpine Club, an important contributor to the Access Fund, a chair for the Wilderness Society, and a chairman on the board for REI. These are only a few of the multitudes of places where Doug served the American outdoor recreationalist. He made a deep and abiding mark on the outdoor community. To read more, click here and here. --A Creston man was recently rescued thanks to RCMP, search and rescue crews, and a very special dog with a keen sense for tracking. On Sunday, December 27th Creston RCMP received a report that a 23-year-old backcountry snowboarder was lost on British Columbia's Thompson Mountain. The Creston man was snowboarding with a friend who was on snowmobile. To read more, click here. --Hundreds of miles of forest roads in Washington State may soon no longer exist. The Forest Service says it can't afford to maintain nearly 800 miles of road in the Mount Baker-Snoqualmie National Forest. To read more, click here. --Skiers and snowboarders were rescued off a stalled lift at Kicking Horse ski resort in British Columbia by helicopter. To see a cool video of a helicopter ski lift rescue, click here. --A young Northern California girl is recovering from her injuries after falling from a chairlift at Squaw Valley Resort in the Lake Tahoe area. To read more, click here. --Snowboarders and skiers were evacuated from a Lake Tahoe resort ski lift after one of the chairs fell off Sunday. No one was on the chair when it fell from the cable and no injuries were reported, Heavenly Mountain Resort officials said. The chair fell as it was traveling on the downhill side of the North Bowl lift at 11 a.m. To read more, click here. --The 2016 Red Rock Rendezvous has been slated for April 1-3. 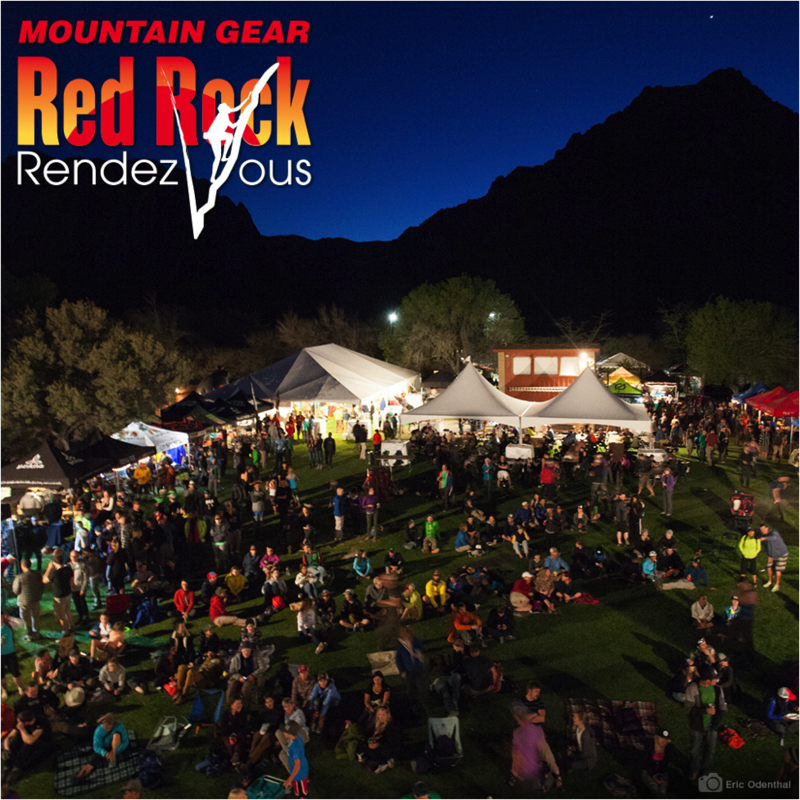 Come join all your favorite AAI guides at the best climbing event and party of the year! To learn more, click here. --Carbondale climber, Ryan Jennings, was killed last week when the pillar he was ice climbing, collapsed. It appears that Ryan was rope soloing when the incident took place. The 2-time Mugs Stump award winner leaves behind his wife and two young children. To read more, click here. --A Colorado man in his 20s was rescued while ice climbing after falling ill, canceling the climb and attempting to self-rescue out of a backcountry area near Telluride last Wednesday afternoon. To read more, click here. --A snowmobiler was killed in Alaska's Hatcher Pass this weekend. To read more, click here. --A woman was transported to the hospital Saturday afternoon, after she fell 35 feet to the ground during a rock climbing accident. The San Luis Obispo City Fire Department says the incident happened around 2:49 p.m. at California's Bishop’s Peak. To read more, click here. --Asheville musicians, along with many friends, family and colleagues of Kayah Gaydish, a mother of two who died in a rock climbing accident in December, will remember her joyful spirit while raising money for her two orphaned children, Caleb and River, this Friday, Jan. 8, in two different music halls. To read more, click here. --There is a conflict brewing in Utah's Wasatch mountains right now. Several ski resorts would like to link chairs and gondolas. Understandably, backcountry skiers don't want to lose their backcountry access to ski resorts. To read more, click here. --The Lyman Spitzer Cutting Edge award winners have been announced. --Three snowboarders are set to be the first western professionals to visit North Korea’s Masikryong ski resort, as part of a tour to the facility in January. Three of snowboarding’s leading names – Terje Håkonsen, Dan “Danimals” Liedahl and Mike Ravelson – will visit the recently completed resort alongside a group of other tourists as part of a trip organised in conjunction with Snowboarder Magazine. To read more, click here. --Denali National Park and Preserve is taking steps to reduce greenhouse gases and improve wildlife viewing for tourists by switching a portion of its bus fleet from diesel to propane fuel starting this spring. To read more, click here. 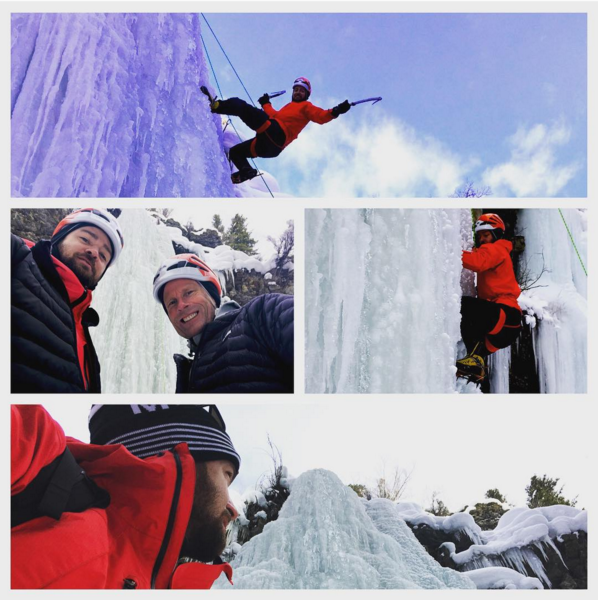 --Actor and musician Justin Timberlake went ice climbing with Conrad Anchor over the new year. It's not clear where the two met up to send the gnar, but we're guessing they were in Montana. To read more, click here. In this video, AMGA Instructor Team Member Jeff Ward demonstrates how to tie a clove-hitch using the handshake method.